We accept Purchase Orders from Schools, Hospitals, Nursing Homes and Major Corporations. Schools and companies may choose to pay with credit card, Paypal or by check. Credit card payments are processed online. If you wish to phone in your credit card information please place your order online using the online checkout and choose the "pass along" option at checkout. This option submits your order without you putting credit card information online. Call us at 1-866-330-1272 with your order number. We also accept Paypal payments through the online checkout. Schools and Companies wishing to be invoiced and pay by Check. In order to pay by check your school or company will have have to follow the two steps below. Checks should be made payable to Special Buys Inc or Bargain Balloons and mailed to one of the following addresses. If your school or company chooses to pay by check we will invoice the school or company for your order. Invoices are sent once with the order and another copy mailed 1-2 weeks after your order has shipped. Invoices are mailed to the billing address provided at checkout. Terms are Net 30 Days. Terms can be extended for those schools or companies which require longer terms. Orders will not be released to ship until a completed order is found in our system and the required documents are received. Please make sure to press the submit order button at the end of the checkout. Step #1-Complete your order online using the online checkout. Choose the pass long option at checkout. Orders must be placed online using the online checkout. 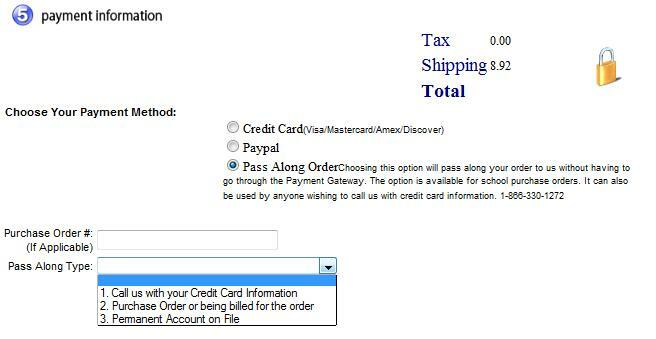 There is an option at checkout called "pass along" (see picture below). At checkout you will choose this option. Then press the button to submit the order. By passing along the order to us you will notify us of your intention to place an order, reserve your stock and be able to print a copy of your pending order which you may submit to your school or company for approval. 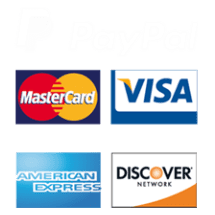 Pass along orders are not shipped until we receive the required documents (step #2) so choosing the pass along option only signifies to us your intention to place an order and to be on the look out for the required documents. Orders will be immediately released for those schools or companies that already have the required documents on file such as a those schools that have an open purchase orders or permanent account. Schools or companies wishing to be invoiced and then pay by check must send us one of the following documents. Otherwise we will not ship your order. (1) Purchase Order-Fax to 805-357-5944 or email to a Purchase Order for your current order only. (2) Open Purchase Order-Fax to 805-357-5944 or email to an open P.O. that will be act similar to a permanent account and allow us to ship current and future orders using the same purchase order. (3) Open a Permanent Account-A permanent account means you will no longer have to fax us for each order placed. We will release your order to ship based on your school or company having a permanent account on file and your account being in good standing. Fax to 805-357-5944 the following information to open a permanent account. On school or company Letterhead a request to open a permanent account. The name and phone number of the person who is authorizing the opening of the permanent account. Billing Address and the Shipping Address. (4) No Purchase Order Letterhead-If your school or company does not use purchase orders fax to 805-357-5944 the following information. If after faxing or emailing your documents you do not not receive a tracking number to your email address within 1-2 business days we suggest you follow up to make sure we received your documents. You can always call or email us the same day you send you documents to make sure we process your order immediately. Our goal is always to ship your order as soon as possible.